Last year most of my hydrangeas were no-shows (or no-blooms, to put it more accurately). The culprit was a late spring frost which did in any hope of flowers from my mopheads (the H. paniculata ‘Limelights’ were fine). Hydrangea macrophylla ‘All Summer Beauty’ flowers next to variegated Hakone grass foliage in my front yard. ‘Blue Danube ‘in bloom in 2008 in my back yard, before I lost the wooden arbor at left. ‘Blue Danube’ is on the left (flower buds not fully colored), with ‘All Summer Beauty’ on the right. The latter’s flowerheads have smaller flowers and in my experience are less likely to color pink in my soil. I think I love this variety so because of the strong purple-blue and purple-pink hues that the flowers have (at least in my garden). ‘All Summer Beauty’ and H. macrophylla ‘Nikko Blue’ have softer blue blooms. ‘Blue Danube’ has colors that can’t be ignored. That may also explain why it’s my favorite hydrangea for cutting – and for photographing when cut. If all this has whet your appetite for a ‘Blue Danube’ or two of your own, I’m happy to report that Hydrangeas Plus offers them for sale online. A couple of weeks ago, I returned from a week in Cuba with the Santa Fe Photographic Workshops. I went to see Cuba before (as one of our group members put it) “there’s a Starbucks on every corner.” It was an incredible trip, and I’m already planning to return next year if I can. I didn’t go to photograph gardens, and the photos I took for the most part fell into other themes – architecture, people, cultural events, and the city itself. More of those images later. But to my surprise, there were plants and parks everywhere. Plants on balconies in pots. Lushly planted pocket/plaza parks. Bougainvillea growing up the sides of buildings. And in some cases, ferns sprouting out of cracks in the facades of some of the older, crumbling but still magnificent edifices that serve as businesses or in-town tenement apartments. While I work on my other images (too many! ), here are a few photos of green spaces in Havana. Bougainvillea growing in the Plaza Cathedral in central Havana. A variety of pots with tropical plants on the second floor apartments surrounding a square. More consistency here, but look how large the plants are growing! Workers setting out new plants (annuals here, probably perennials there) in a small park in a central Havana. Cubans can be found at any time of day (or night) in the many parks dotting the center of Havana. This looked like a self-seeded plant (or maybe a container plant) that has been allowed to grow ad infinitum. Havana residents use their balconies to dry laundry and grow plants. A rare ‘gated garden’ like you might see in Charleston or Georgetown. Plants on a balcony above a restaurant spill over and soften the walls. 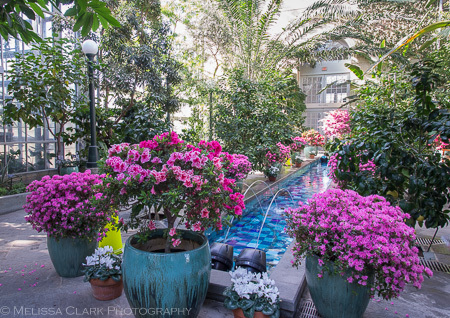 Several weeks ago, before the DC area became inundated with snow, a photographer friend had some business to attend to at the U.S. Botanic Garden in downtown DC. The visit entitled her to a parking pass right in front, and she was kind enough to invite me along. I had forgotten how nice it is to see plants in the winter without having to freeze any part of one’s anatomy off in the process. The Botanic Garden doesn’t allow tripods, so we went armed with high ISO’s and explored various parts of the building, starting with the entry hall. Azaleas and cyclamen in bloom under a canopy of tropical palms in the entry hall of the US Botanic Garden. The Garden’s interior spaces are designed to mimic various kinds of climates, ranging from tropical jungles to desert spaces. Along the way, I saw orchids, lots of air plants, misting water (in the jungle area), and birds of paradise. The Children’s Garden and the “Southern Exposure Garden” were “closed for the winter” but would be worth a return visit. If you’re in the DC area, don’t miss this gem, tucked away up near the Capitol. It’s a great place to forget winter and enjoy yourself. The soaring three-story “jungle” space, viewed from the second level. The perfect place for a beauty shot. Cymbidium ‘At Sea,’ an orchid on the lower floor of the Jungle. The smooth gray bark of a ficus tree (I think), reaching stories up in the Jungle Garden. Misting stations keep the Jungle humid, and are a challenge for the photographer. Blue and yellow bird of paradise plants, with an air plant “wall hanging” nearby. More white orchids in the Jungle. The Desert Garden, with visitors enjoying warmer temperatures than those outside. Moving out of the Jungle into drier parts of the Botanic Garden, I spotted this Lunaform pot. Wow, were those azaleas going on a carousel ride? With my computer still out of commission, here’s an encore appearance of another one my favorite posts. Hope you enjoy seeing these lotus photos again. Did you know that a lotus’s flowers, seeds, young leaves and rhizomes are all edible? (Thank you, Wikipedia.) You may have seen the dried cups, below, used in flower arrangements. as are the backlit leaves when the photographer gets lucky. 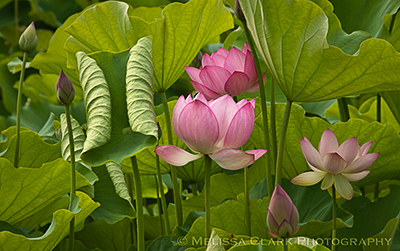 Lotus flowers can range from 4 to 12 inches when open. There’s an oft-repeated saying among photographers that the best camera is the one you have with you. In March, I went on a fabulous photo workshop in Charleston with two first-class photographers and teachers, Alan Sislen and Colleen Henderson. I took along my new Nikon D600 and soon I’ll share some of the photos I took with it. But today’s post is about my other “best camera,” which now accompanies me everywhere, the one in my iPhone 5. Colleen taught us some pointers on great apps to use, and now I find myself reaching for the iPhone more often than ever. Here’s a good example of what you can do with it. This trio of Clematis ‘Dawn’ was taken and “framed” with Camera+ and captioned in the Over app. Echevaria ‘Morning Light’ photographed in Camera+, edited with Handy Photo, and captioned in Over. Even in low light, Camera+ does a great job capturing a wide range of tonal values. This was taken around 7 pm a week or so ago in downtown Washington DC. (Copyright added in Over; no copyright symbol on our keyboards yet!) And it works well with azaleas, provided you don’t ask it to capture loud pink hues up close. A ‘Madame Butterfly’ azalea at LPI’s shop in Poolesville. Like to experiment with black and white? My other often-used app is Hipstamatic, when I want to capture patterns and shapes, or color isn’t the most important aspect of the image. A group of variegated Solomon’s Seal in my back yard. With Hipstamatic, although the app itself isn’t all that expensive, you can spend a bunch of money adding “packs” to shoot with (the one above uses the “James W + BlackKeys B+W” pack). Another advantage of working with these iPhone images, especially for gardeners, is that they take up so much less space on your hard drive than images captured with a DSLR. Particularly now that I have a D600, which takes 24MB images, my computer is slowing down and filling up really fast. To work on iPhone images, I usually download them to Dropbox, open them on my iPad if I want to add a caption or work with HandyPhoto, and then I can delete them or save them to my computer if I like them. Otherwise, they may end up on my Facebook page (or my company’s FB page) and there it stops. I’ll close with another favorite closeup, of a tree peony. I took this one in a client’s garden last month. The iPhone was the only camera I had with me (although I usually have my Canon G11 around, for some reason it wasn’t with me that day). So glad I had it. Tree peony, courtesy of the “best camera” I had with me. Recently, the Pennsylvania Horticultural Society announced its most recent Gold Medal Awards for garden plants. I was excited to see that my own excellent taste in plants had been validated by the inclusion of Chaemacyparis obtusa ‘Nana’, or dwarf Hinoki falsecypress. My very own dwarf Hinoki falsecypress, about 12 years (I think) after planting. It’s in a sunny but occasionally windswept spot on the eastern side of my yard. (iPhone 5 photo, taken with Camera+ and captioned in Over app). I fell in love with this shrub/tree during my education as a landscape designer. I love(d) its evergreen presence, the somewhat loose (but not out of control) way its branches and needles grew in a whorl-like manner, and the idea that you could include it in a mixed border or small garden and its slow-growing nature meant it wouldn’t eat the yard/house. As both a gardener and photographer, I’ve found other aspects of it to admire. A close-up of the foliage. This image (taken at the National Zoo) wound up being used as the front page of our landscape company’s brochure. The bark exfoliates if the plant has been mislabeled (as sometimes happens in nurseries) and it’s not a ‘Nana’ after all. See this example from Filoli. The bark of a non-‘Nana’ Hinoki falsecypress on the grounds of Filoli Gardens in Woodside, California. And last but not least, it produces these adorable little mini-cones. Look closely or you might miss the cones! The PHS chose this plant because, as my friend and colleague Jane Berger wrote in her blog post announcing the awards, “it is sorely under-used compared to dwarf Alberta spruce”, which is planted in so many housing developments.” (Don’t get me started on Alberta spruces . . .). The wood is rot-resistant and in Japan has been used for building temples, shrines, palaces, Noh theatres, and goodness knows what else. But if you aren’t in the market for hardwood to build with, plant it for its beauty. It’s hardy from Zones 5-7, and possibly into Zone 8A.